A solid bed designed to impress and it certainly does in terms of functionality. Feel on top of the world with stylish loft living, leaving plenty of space below for studying using the spacious built in desk. Fill the integrated shelves with books, CD's, games whilst chatting to your friend lazing about in the comfy chair bed which also creates a speedy sleepover solution. Store, study, chill and sleepover in the space of just one bed! If you want to spice up the bed with more colour and storage space we have designed our Cube Unit to fit neatly under the desk; good thinking if space is tight! Mainly constructed from solid pine with some parts in MDF. Durable and lasting quality. 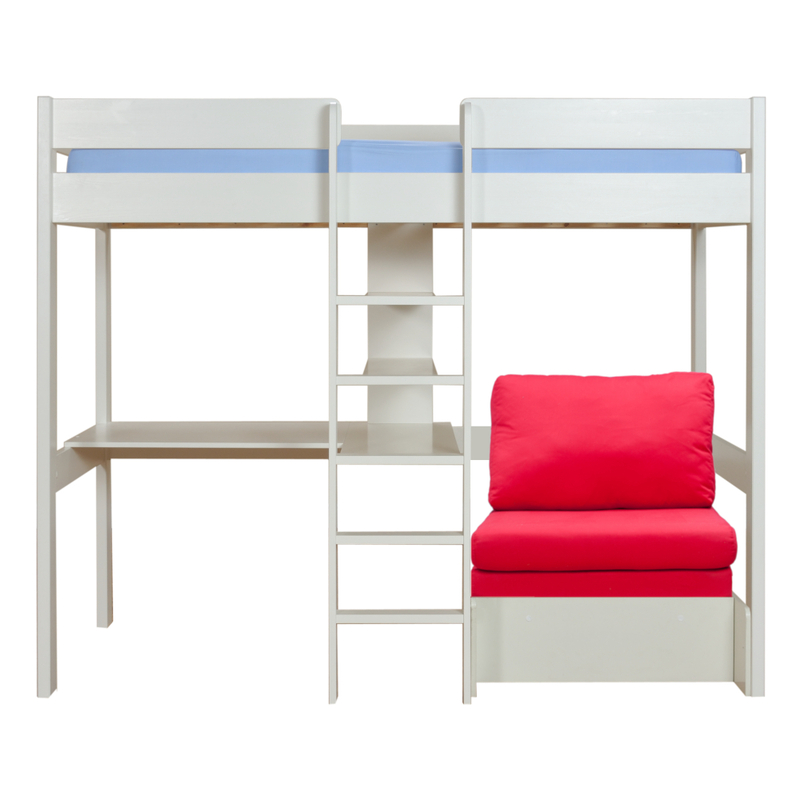 Includes Uno Highsleeper with integrated desk and shelving and red Chair Bed. Features Highsleeper bed with integrated desk and shelving system. Recommended min age 6 years for sleeping in top bunk. Size of Bed H1744xW1051xL2082mm with chair bed closed. Easy extendable Chair Bed size H260xW802xL935mm in closed position (extends to max length 2033mm). Hinged foam cushion set which flips out to make a comfortable mattress with a cosy cushion for the pull out bed. Wide choice of colour for the chair bed cushion set: Red, Pink, Lime Green, Black & Blue. Integrated desk and shelving unit can be positioned LH/RH to suit your room. Flat steps on ladder for comfort and safety.